Authorities in Philadelphia interviewed several persons of interest in the brutal attack of a gay couple in Center City, a day after a reality television star shared a photo depicting the alleged assailants online, causing a social media firestorm that uncovered the identities of the possible attackers. 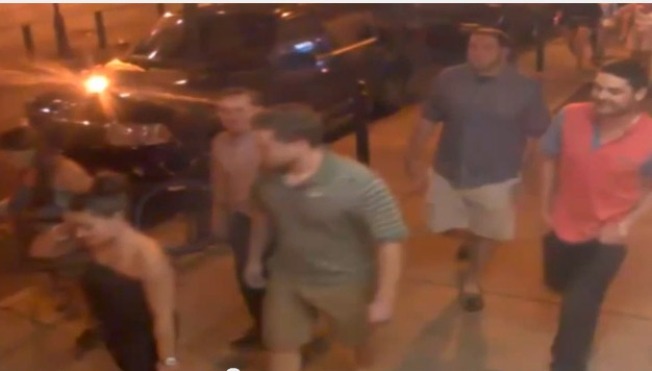 Police say four of the individuals pictured in surveillance video of the attack, along with their lawyers, arrived at Philadelphia Police Headquarters Wednesday night. All were questioned by investigators. The surveillance video, released by Philadelphia Police Tuesday, showed a group of intoxicated twenty-somethings walking near the intersection of 16th and Chancellor streets, just south of Walnut Street, around 10:45 p.m. Thursday – only moments before a gay couple was assaulted. Hours after investigators made the footage public, Greg Bennett -- a one-time star of the "Real Housewives of New Jersey" -- sparked a public outcry to find the attackers on social media. Bennett shared a photo on Twitter of a group of young people, similarly dressed to those shown in the surveillance video, inside a uniquely decorated restaurant hours after police released the footage. He said "a friend of a friend of a friend" sent him the picture, which shows a man wearing an orange vest -- a clothing item that stood out in the surveillance video. Authorities have yet to confirm if those pictured in the photo Bennett shared are suspects in the assault. Other key details in the image led Philly's Twitter community, including the well-known acerbic account, @FanSince09, to determine the restaurant where the group was dining -- La Viola on the 200 block of South 16th Street. @FanSince09, who asked not to be identified, continued investigating and found out who checked in to the Italian eatery on social media Thursday evening. "Some of the names matched up with the names I was hearing from tipsters," he said. The social media sleuth shared the information with Philadelphia Police Detective Joseph Murray, who is also well-known in the Twitterverse. Members of the group -- some of whom stood by while their friends punched and kicked the 27- and 28-year-old victims in the face, head and chest -- began contacting investigators late Tuesday through their attorneys so they could turn themselves into police, according to multiple sources. Additional sources tell NBC10 the alleged attackers are alumni of Archbishop Wood High School. The school's assistant basketball coach resigned Wednesday after school officials confronted him over his alleged connection to the attack. The Citizens Crime Commission is offering $1,000 reward for information leading to an arrest and conviction in the case, while another Center City restaurant -- Pennsylvania 6 -- is offering a $10,000 reward. Defense attorneys who represent some of the suspects tell NBC10 more video exists that will paint a different picture of what happened. Authorities initially said they were investigating the beating as a hate crime. But Pennsylvania's hate crime law does not cover crimes motivated by a person's sexual orientation. Police have yet to issue arrest warrants for the suspects and the investigation continues.